The 2018 Perennial of the Year will have both people and pollinators buzzing with joy! Allium ‘Millenium’ is a relative of the common onion and a standout in a late summer garden here in the Lakes Region of New Hampshire. Blooming at a time when most of the garden begins to fade, it offers a welcome wave of color. 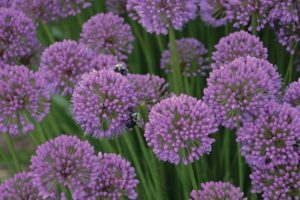 It is a low maintenance, dependable perennial that puts out masses of purple blooms above neat, grass-like green foliage that remains long after the flower passes. Hummingbirds, bees, beneficial insects, and butterflies love the flowers, which are laden with pollen and nectar. They grow best in full sun and have a very drought resistant constitution. ‘Millenium’ will grow foliage around 10-15” tall with each scape producing two or three showy two-inch globes of purple florets that will last as long as four weeks. ‘Millenium’ will live happily in USDA zones 4-9. Once established, about the only maintenance it needs is cutting back foliage in late fall after the plants fade. A large mass of ‘Millenium’ looks amazing on it’s own, but it also plays well with others and looks great paired with numerous perennials. Shorter goldenrods like ‘Little Lemon’ in front and the lacy silver foliage of a Russian Sage behind, would make a lovely show in the garden. No serious pest problems have been reported. Leaf spot may occur in overcrowded growing conditions. Deer and rabbits leave ‘Millenium’ alone. Alliums are sometimes avoided due to their reseeding behavior. Fortunately ‘Millenium’ exhibits 50% reduced seed production, raising less concern for self-sown seedlings. Allium ‘Millenium’ has a fibrous root structure forming an ornamental herbaceous clump easily propagated by division. Once in the garden, ‘Millenium’ can easily be lifted and divided in either spring or fall.